Chunda ni Makati (Gujrati) can be literally translated into English as ‘Mincemeat Bread’. I think ‘Makati’ is a mis-say of ‘Mkate’ (bread in Kiswahili). My mother learnt it at ‘sasre’ (at her in-laws), the layer of potatoes on the top is a recent addition. She says that traditionally eggs were cracked on the top of the meat to form a flower-like pattern and she also thinks it’s from old Zanzibar. 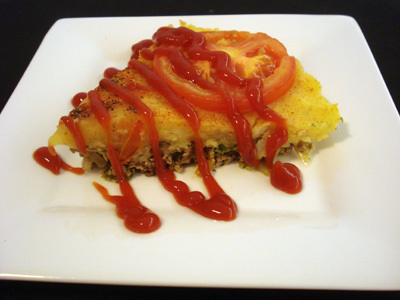 This is a relatively balanced dish with starch, protein and fiber. The dish is a two step process. The meat and potatoes will be cooked separately. Wash the ground beef in a colander and squeeze out excess water. Place in a pot on medium-high heat and add the garlic paste, ginger paste, black pepper powder, cumin powder, coriander powder, turmeric, salt and red chili (or green chili). 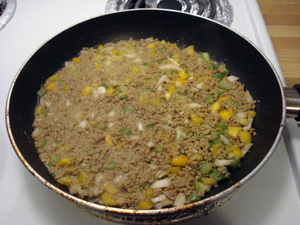 Incorporate all the spices into the ground beef and break any lumps that form. This is sort of like the mixture made for stuffing Samosa pastries. 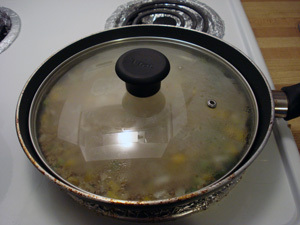 Cook the meat until all water has evaporated and is nicely browned. This takes about 12-15 minutes. Add lemon juice. 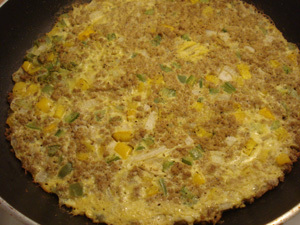 Once cool, add the green pepper, onion, cilantro and whatever other vegetable chosen (I’ve added yellow peppers) and mix well. In a separate bowl, crack the eggs and beat well. 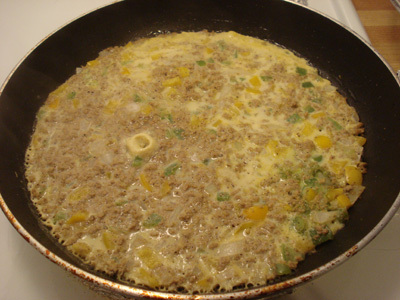 Add the eggs to the mince meat mixture and mix well. 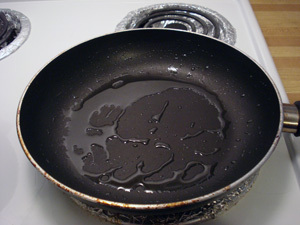 Grease an 8 or 10 inch wide frying pan (choose your best looking frying pan since the dish is served in the frying pan!). Turn the heat up to a medium-high setting. When the oil is warm, pour the mincemeat mixture into the frying pan, spread and flatten to cover the entire bottom of the frying pan. 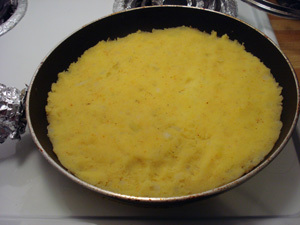 Cover the frying pan and let it cook till the top has some white spots (indicating that the egg is cooking) and when the pan is jiggled, nothing moves! Turn on the oven on the broil setting. Cover the frying pan’s handle with foil if it is not oven-proof and place the frying pan directly under the grill to cook the top of the meat (takes about 5-8 mins). Once cooked, take the frying pan out of the oven. Boil the potatoes with a pinch of turmeric and some salt. When a knife easily pierces the potatoes, the potatoes are cooked. Drain the water. Mash the potatoes using a fork. Add salt, chili powder and lemon juice to taste. Continue to mash till smooth. 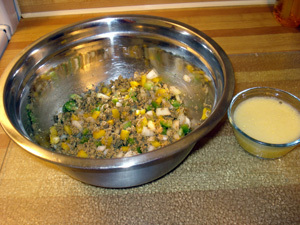 Pour the mashed potatoes onto the meat mixture and spread it with a spoon. Dust some paprika powder and arrange the tomato slices on top of the potatoes. 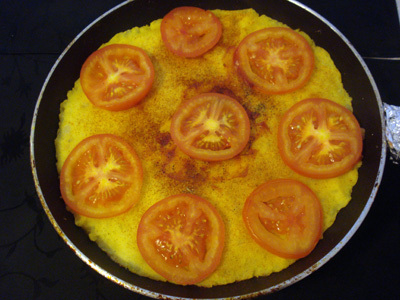 You can place the frying pan under the broiler again if you want to cook the tomatoes, I prefer not to. If you like cheese, you can put some shredded cheddar/mozzarella on the top of the potatoes and broil till melted. If this meal is not being serving immediately, it can be re-heated on the stove top or microwave. 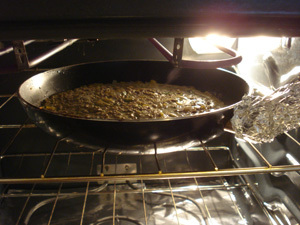 If heating on a stove-top, cover the frying pan loosely with aluminum foil and heat on the lowest setting. Alternatively, cut out the pieces and place in a microwavable dish and microwave for 2 minutes.